I know some of my readers don't care about the "sports" posts but it's my blog so they are going to keep happening once in a while. This is the best time of the year for me sports wise, MLB is heading into the playoffs, the NFL and US college football are getting underway and, normally, the NHL would be just around the corner . Of course the likelihood of the NHL returning any day son isn't looking good with the owners having decided that giving the talent 57% of the revenue is a bad business model, even though they made it up themselves, and the players, like most people, aren't willing to relinquish things they already have so I think this one is going to drag on for awhile. I don't think the entire season will be lost, as happened in 2004-05, but a shortened season ala the 1994-95 lockout is a pretty likely scenario. 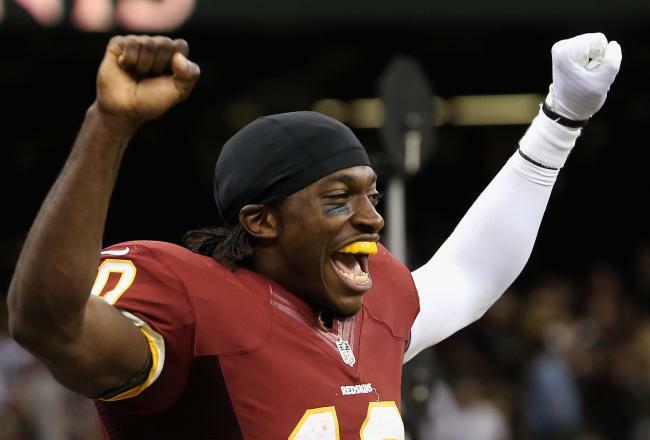 In the NFL the season opened this week, after avoiding their own potential work stoppage in 2011, and my beloved Redskins posted a marvelous first week result behind their wonderkind rookie QB Robert Griffin III, or RG3 as he is known. Griffin cost Washington three first round picks, and a second round pick, to end their quarterback carousel and at least yesterday he was worth it leading the 'Skins past the Saints, in New Orleans, and putting 40 points on the board. Only time will tell but right now it looks like the Washington quarterback situation is solved, now about that pass defense. The NFL labour struggles aren't over however, while the teams and players have worked out their differences the league has not come to terms with the officials leading to week one games being refereed by replacement officials who apparently weren't as bad as expected. The situation did lead to the sports quote of the week however as after the opening game NY Giants linebacker Mathias Kiwanuka was quoted as saying : "I haven't been held this much since I was a baby"
In baseball the pennant race in the American League East is as tight as Uncle Donnie's wallet when it's time to buy a round of drinks, with the Evil Empire holding a slim one game lead on the over achieving Baltimore Orioles. Baltimore are defying all odds in that they are 16 games over .500 while having scored less runs than their opposition, no other team in MLB with a negative run differential is above .500 yet there are the O's at 78-62 making life extremely uncomfortable for the suddenly struggling Yankees. I grew up a Yankees fan, and will likely always be one, but I have a bad feeling about this year, oh well it could be worse, I could be cheering for the last place Boston Red Sox (man it feels good to write that) . The other positive I have as a Yankees fan is watching their captain, #2, Derek Sanderson Jeter play. Jeter might possibly manage to be the most under rated and most over rated player of all time. You will still find people argue that Jeter is not a Hall of Famer despite that fact that, barring a season ending injury or a meteor hitting earth, sometime this week Jeter will pass Willie Mays in career hits. Just roll that around in your head, Mays is generally regarded as one of the ten greatest players ever to play the game and yet Jeter trails him by only four hits. 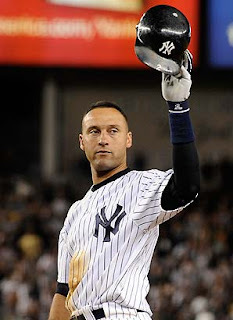 In fact at age 38 Jeter currently leads the American League in hits and will move into the top 10 all time early next season, yet you will still find people who think he's not a Hall of Famer, of course most of them are Massholes but still . On the other hand Jeter has no good reason to have five Gold Glove Awards in his trophy case, but after getting jobbed in the 2006 MVP voting I'm guessing Jeter figures he might as well keep the Gold Gloves . Anyway, I hope the Yankees make the post season. I hope the Redskins continue to play well. I hope the Red Sox continue to lose until the end of time and I really hope the NHL owners and players come to their senses and realize that another work stoppage will be the end of the league .